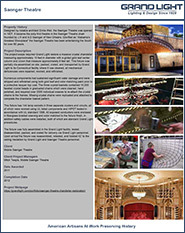 Designed by notable architect Emile Weil, the Saenger Theatre was opened in 1927. 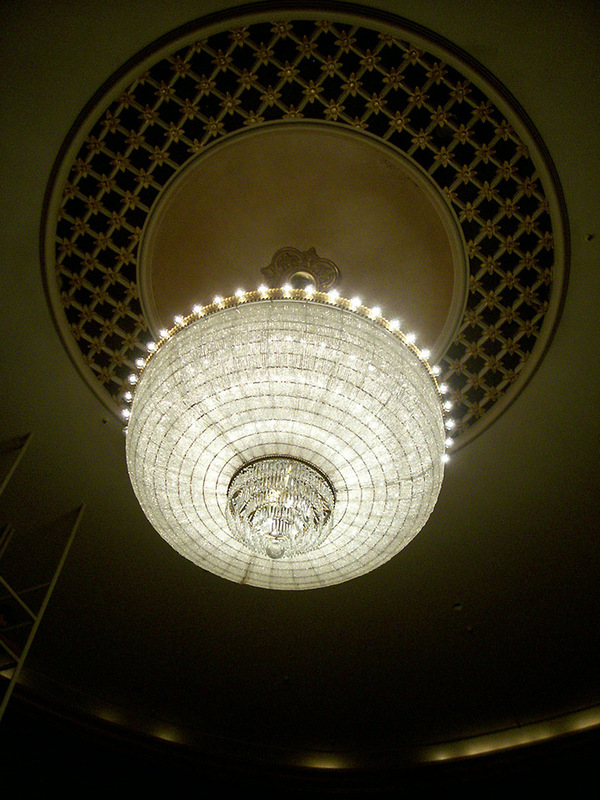 It became the sixty-first theatre in the Saenger Theatre chain founded by J.H and A.D Saenger of New Orleans. 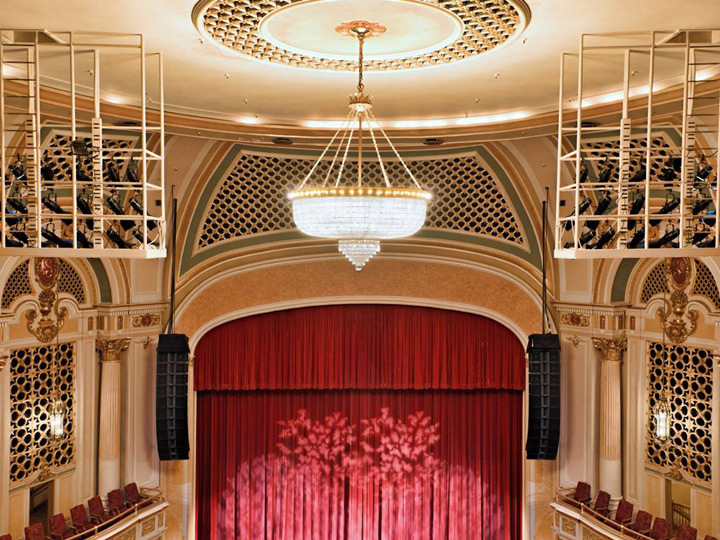 Glorified as “Alabama’s Greatest Showplace” the Seanger Theatre has been entertaining the South for over 80 years. 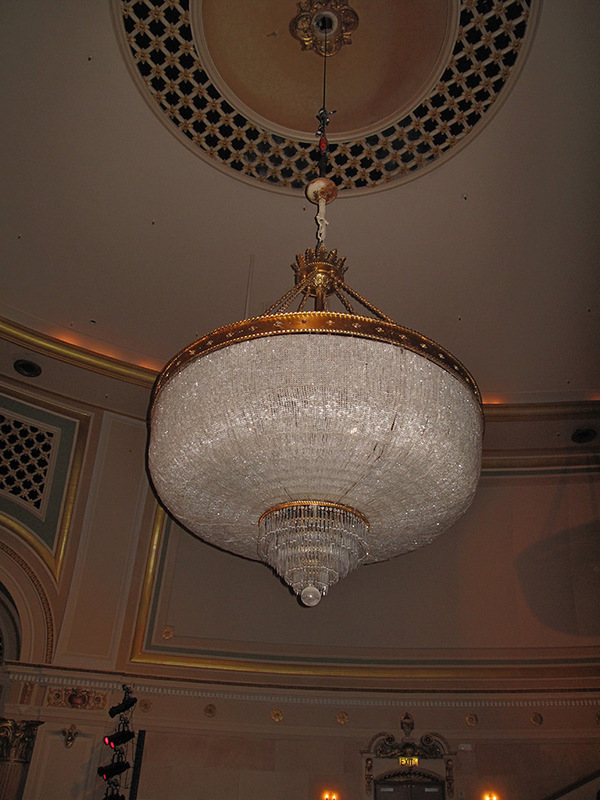 Grand Light restored a massive crystal chandelier measuring approximately 10 feet in diameter with a gilded gold leaf center column and crown that measure approximately 8 feet tall. 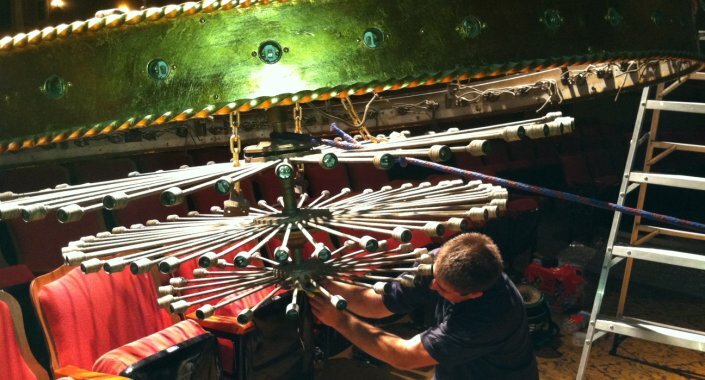 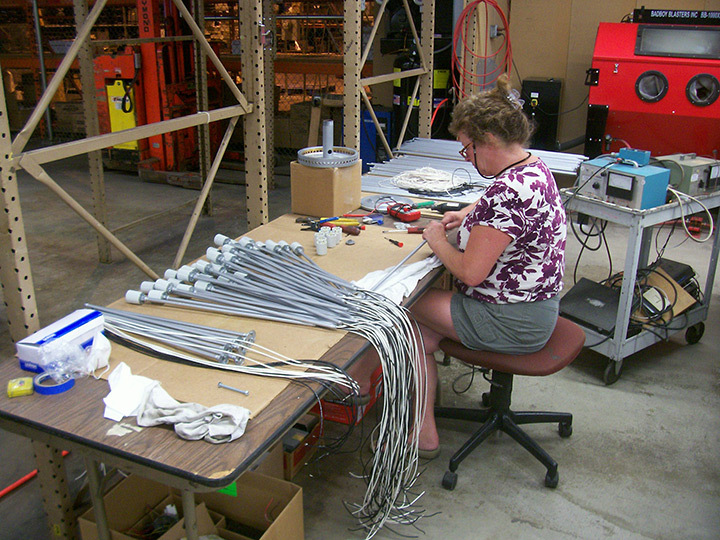 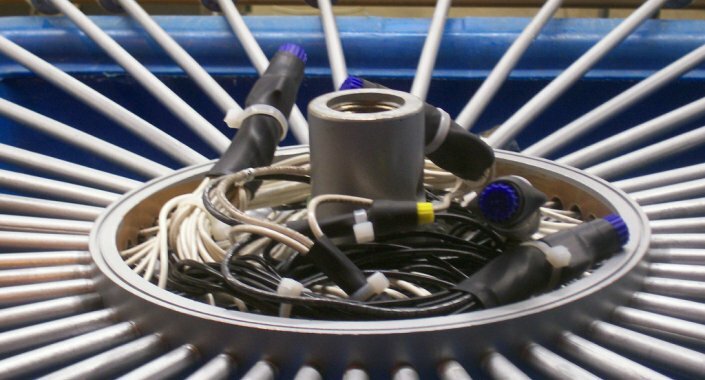 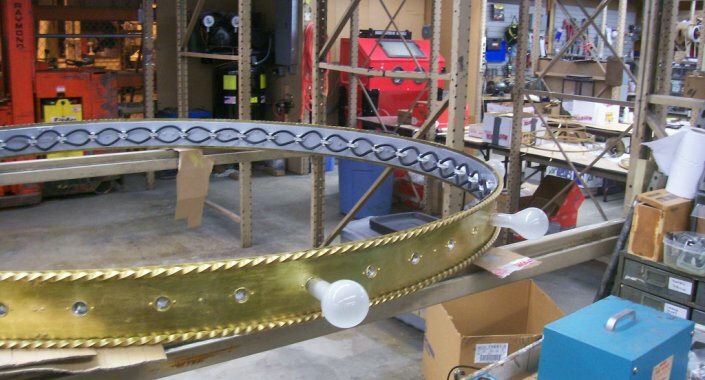 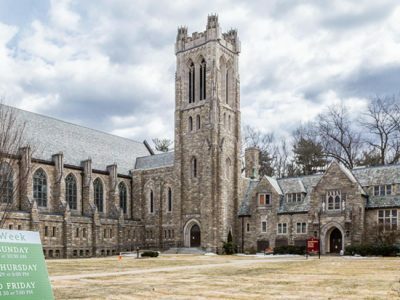 This fixture was partially dis-assembled on site, packed, crated, and transported by Grand Light to its Connecticut facility where it was cleaned, all mechanical deficiencies were repaired, rewired, and refinished. 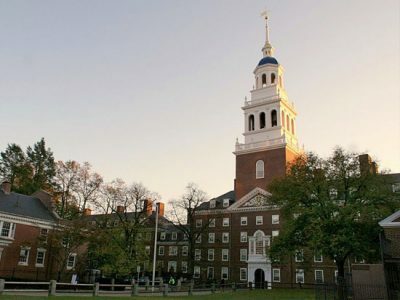 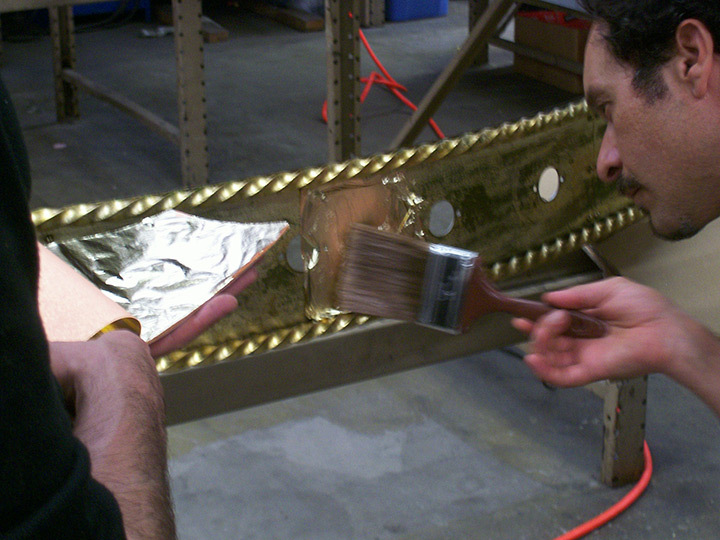 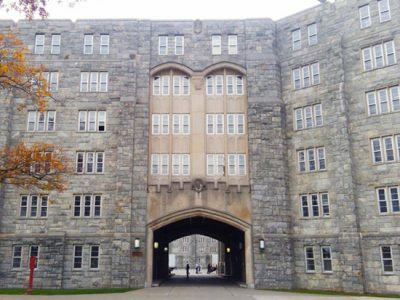 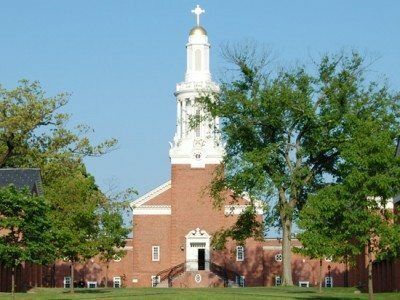 Numerous components had sustained significant water damage and were stripped and refinished using both gold leaf and color matching paint prior to a protective lacquer top coat. 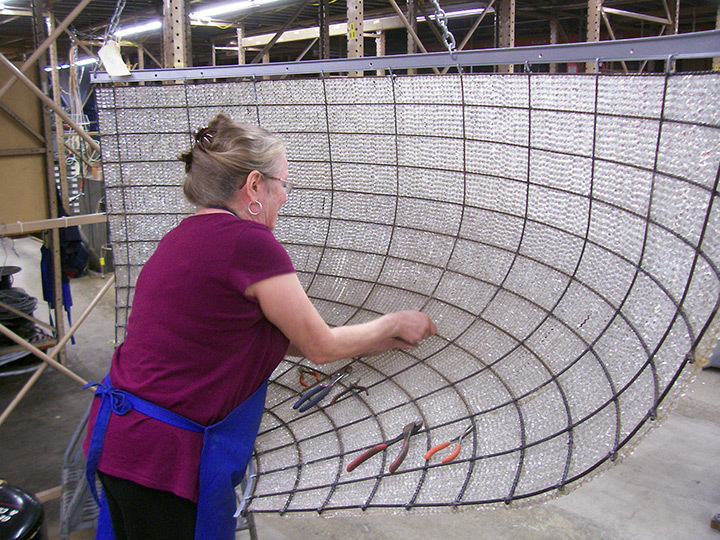 The three crystal baskets contained 10,000 faceted crystal beads in graduated chains which were cleaned, hand polished, and required over 2500 individual weaves to re-attach the crystal chains to the frames. 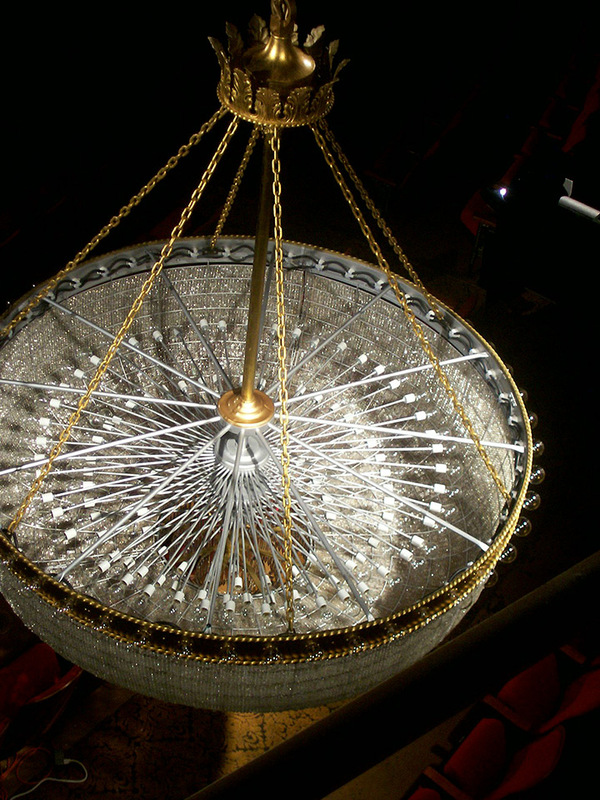 Missing crystal chains were replicated and attached to complete the chandelier basket pattern. 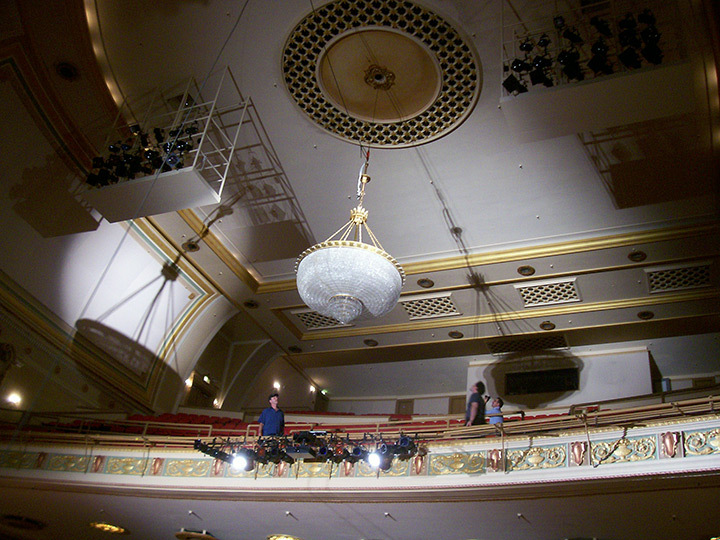 This fixture has 144 lamp sockets in three separate clusters and circuits, all of which were rewired using UL listed components and HIPOT tested in accordance with UL standard 1598. 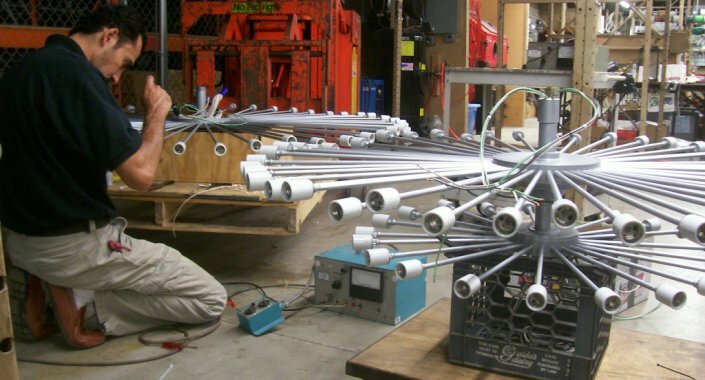 All exposed conductors were enclosed in fiberglass braided sleeving and color matched to the fixture finish, in addition safety cables were installed, both of which are standard Grand Light procedures. 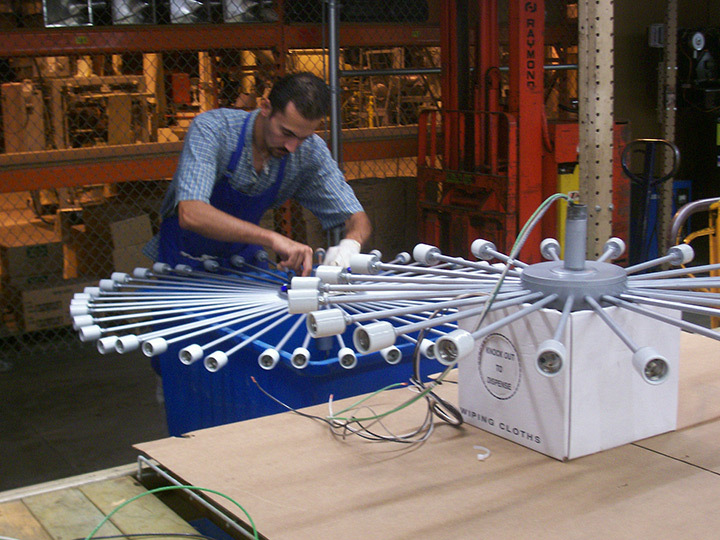 The fixture was fully assembled in the Grand Light facility, tested, disassembled, packed, and crated for delivery via Grand Light personnel. 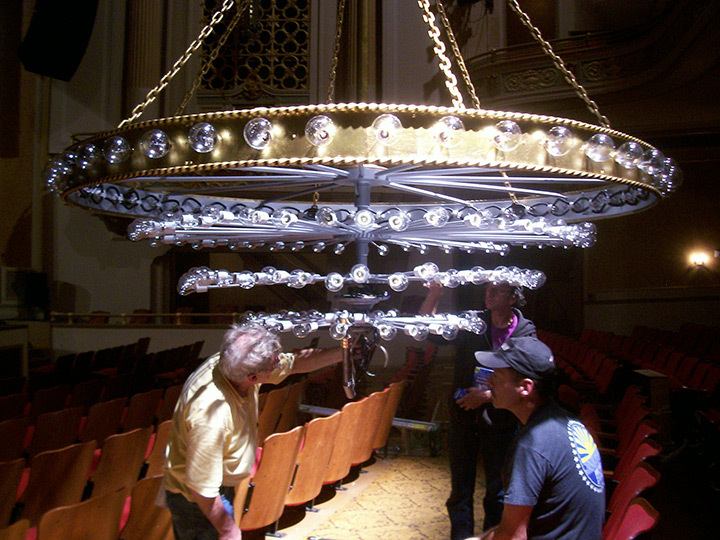 Upon arrival the fixture was reassembled, retested, and hoisted 42’ to the ceiling medallion by Grand Light and Saenger Theatre personnel.